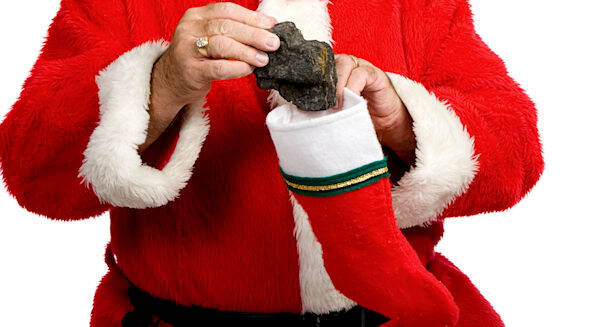 There's still plenty of time for a certain Jolly Old Elf to visit Wall Street and deliver the Santa Claus rally that traditionally leads up to Christmas, but so far this month, it's been mostly coal in the stockings of investors. That's raising questions about whether were at the start of a long-predicted market correction. The Dow Jones industrial average (^DJI) fell another 104 points. The blue chips have now lost ground in 8 of the last 10 sessions, and are down more than 350 points from the record high set two weeks ago. The Standard & Poor's 500 index (^GPSC) dropped 6 points, and the Nasdaq composite (^IXIC) lost 5. The S&P 500 announced changes to its closely watched index -- most significantly, adding Facebook (FB). That boosted shares of the social network giant by 5 percent, as mutual funds that track the index will be forced to buy it. Mohawk Industrials (MHK) is also being added. It added less than 1 percent. But JDS Uniphase (JDSU) and Teradyne (TER), both of which are being dropped from the S&P 500, each lost 3 percent. Elsewhere, Lululemon (LULU) tumbled nearly 12 percent -- not over worries about too-sheer yoga pants, but an earnings outlook for the current quarter that's a bit skimpy. Cisco (CSCO) lost 2 percent after trimming its long-term growth forecast. The tech giant says it is "extremely challenged" in emerging markets, including China and India. Ciena (CIEN), which also provides networking equipment, fell 7 percent. Its net badly missed expectations and revenue guidance was a bit weak. And AmTrust Financial (AFSI) tumbled 12 percent after an analyst raised questions about the insurance company's financial reports. On the plus side, a pair of IPOs had successful debuts. Hilton Worldwide (HLT) rose 7.5 percent from its initial pricing level. And Aramark (ARMK), the food service company at stadiums and big cafeterias, gained 13 percent. Hovnanian (HOV) gained 6 percent. The homebuilder's net topped expectations and it said both deliveries and orders are rising. And some biotechs rebounded from recent selling. Sarepta (SRPT) jumped 19 percent. The Labor Department reports producer prices for November at 8:30 a.m. Eastern time. Who’s more powerful: the omnipotent head of a corroding but still feisty power or the handcuffed head of the most dominant country in the world? This year’s snapshot of power puts the Russian president on top. Putin has solidified his control over Russia (“dictator” is no longer an outlandish word to ponder) and the global stage. Anyone watching the chess match over Syria has a clear idea of the shift in the power towards Putin. The ex-KGB strongman -- who controls a nuclear-tipped army, a permanent seat on the UN Security Council and some of the world's largest oil and gas reserves -- is allowed to serve two more terms, which could keep him office until 2024. His signature legislation, Obamacare, is under fire, U.S. allies are outraged over NSA surveillance overseas, and the government shutdown for 16 days in October begs the question: Who's in control here? It appears that President Obama's lame duck period has set in earlier than usual for a two-term president, causing him to drop one notch from the No. 1 spot. To be sure, though, the leader of the free world remains in charge of the most powerful nation in the world, with the largest, most innovative economy and the deadliest military. Recently promoted in March, the 60-year-old is the paramount political and military leader of China. Xi exercises near dictatorial control over 1.3 billion people (close to 20% of the world's population). China has the world's largest central bank, with $3.5 trillion in assets -- and owns some $1.3 trillion in U.S. securities, making it the largest foreign shareholder of U.S. debt. Along with India, the country is predicted to overtake the U.S. in aggregate GDP in coming decades; it is currently $8.2 trillion. There are 122 billionaires in the country, up from zero one decade ago. In addition to his title of general secretary of the Communist Party in China, Xi is also president of the People's Republic of China and the chairman of the Central Military Commission. The world's most powerful woman is the backbone of the 27-member European Union and carries the fate of the euro on her shoulders as Germany's chancellor. Merkel's hard-line austerity prescription for easing the European debt crisis has been challenged by both hard-hit southern countries and the more affluent north, most particularly French President Francois Hollande. Merkel is fresh off a commanding reelection victory, and has served as ­chancellor since 2005; the first woman in the position. Merkel has earned the top spot on the FORBES list of Most Powerful Women In The World for eight of the past 10 years. Gates is the wealthiest man in the U.S., despite his past gifts of more than $28 billion to the Bill & Melinda Gates Foundation. He bolstered his foundation's efforts to eradicate polio in April, securing $335 million in pledges to the cause from six billionaire comrades, including $100 million each from Mexico's Carlos Slim and New York City Mayor Mike Bloomberg. Shares of Microsoft jumped in late August on news that Steve Ballmer will step down as CEO; Gates will remain chairman of the software company he cofounded with Paul Allen in 1975. He and fellow Most Powerful Warren Buffett have thus far convinced over 100 billionaires to sign on to the Giving Pledge, a promise to donate at least half one's net worth to charity. Big Ben is stepping down as of Jan. 31, 2014, and Janet Yellen has been nominated to lead the Fed next year. Bernanke has served as chairman during some of the biggest financial challenges since the Depression. The former Princeton professor’s decisive actions and policies helped to avert a global economic meltdown during late 2000s fiscal crisis, and jump-started a still-moderate U.S. recovery. The American economy's "adult in the room" has said that there is only so much the Fed can do; politicians are the ones with the power to keep us from going over a fiscal cliff. Duke heads the world's No. 1 retailer ($470 billion in revenues in 2012) and biggest private employer (2.2 million employees). Wal-Mart can make or break a company simply by deciding to stock its products. Last year, Sweden's $785 billion-in-assets sovereign wealth fund (none bigger) dropped its Wal-Mart stock -- reportedly worth about $140 billion -- on advice from its Ethical Council that cited a "serious and systematic abuse of workers' rights."